Black cumin seed oil, technically known as Nigella Sativa or N. sativa, has been used for thousands of years for several maladies, disorders, and both infectious and non-infectious diseases, especially throughout ancient Mideast, Egypt, and Greece. Currently, black cumin seeds and oils (from the seeds) are used as traditional medicines in the Mideast as well as parts of Africa and Asia. Its principal and most abundant bioactive phytochemical ingredient is thymoquinone. In addition to the multitude of anecdotal reports demonstrating efficacy and safety, there has been a growing curiosity among modern medical researchers who have been researching black cumin seed oil’s thymoquinone for the past few decades. Two more studies have been added in 2018, both relating to black seed oil’s ability to relieve arthritis. One was a review article and the other a human trial study. A Turkish study, Investigation of the effect of black cumin oil on pain in osteoarthritis geriatric individuals, was conducted on 60 elderly human subjects suffering from knee pain. The purpose of the study was to determine the analgesic properties of N. sativa or black cumin seed oil using topical applications. The subjects were divided equally with 30 of them rubbing black cumin seed topically on their knees three times a week for one month. 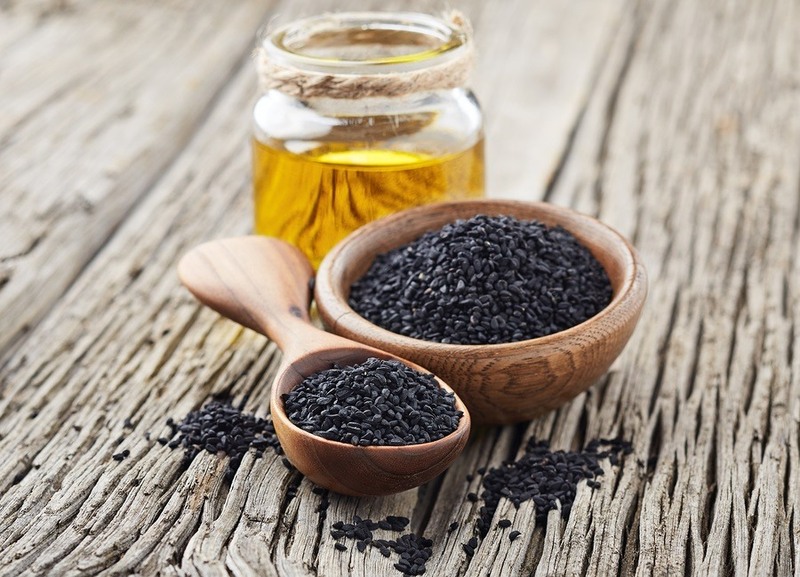 The other 30 patients with knee pain continued with their standard prescriptions and treatments without topically applied black cumin seed oil as a comparative control group. … the pain relieving properties of black cumin oil is effective on geriatric individuals living with knee pain. On July 15th, 2018, the journal Phytomedicine produced an Iranian review article of studies devoted to determining the analgesic and healing potential of Nigella Sativa for rheumatoid arthritis, which may have included the one just summarized for knee pain. It was titled Nigella sativa fixed oil as alternative treatment in management of pain in arthritis rheumatoid. The review article’s purpose was to evaluate the potential effects of N. sativa fixed oil (black cumin seed oil) for pain and inflammation from arthritis rheumatoid. Using information from accessible and inaccessible sources for finding studies involved with black cumin seed oil, they reviewed animal and clinical studies, four done with oral consumption of the oil and one that was topical. None of these five studies had reported adverse effects. The results of our investigation showed N. sativa fixed oil, especially thymoquinone content had valuable anti-inflammatory and analgesic effects via different pathways. Regardless of the usual commentary of advising further studies, which is common with studies unless they’re submitted for regulatory agency and marketing approval, they all support the efficacy and safety of using Nigella Sativa for rheumatoid arthritis. Another review article of black cumin seed studies discovered positive results on so many health issues it had to categorize and highlight them with a summary. It is titled Novel mechanisms by which N. sativa and TQ manifest their immunomodulatory roles: A comprehensive review. This review was published earlier than the studies covered in the first part of this article, September 2015, by International Immunopharmacology. Abbreviations: TQ is thymoquinone; Th1 and 2 – T cells are involved with stimulating macrophage production, interferon, interleukin, tumor necrosis factor; NK stands for natural killer cells that can destroy cancer cells (cytotoxic activity). N. sativa and TQ exert potent anti-inflammatory effects. N. sativa and TQ modulate cellular and humoral [body fluid] immune responses. N. sativa and TQ regulate Th1/Th2 differentiation and NK cytotoxic activity. N. sativa and TQ can be effective in regulating allergy, autoimmunity, and cancer. All of these reports are inclined to promote Nigella sativa as an adjunct for current pharmaceutical treatments or to entice pharmaceutical pursuits of isolating the active ingredient, in this case, thymoquinone, to produce another drug that can be patented for high profits. There is a cultural tendency in modern society to question natural resources for healing and look to man-made chemical interventions for rapid miraculous healing. Unfortunately, the other phytochemicals and nutrients that produce a naturally balanced synergistic agent are left out. The need for testing these synthetic drugs without their cohort compounds is based considerably on proving not too many will be harmed or killed by them. The results are usually mixed at best and often disastrous after initial approval and years on the market. Accepting empirical evidence, i.e. – a they or we used it, we or they got better without problems approach, is rejected by a medical establishment that insists on knowing how every molecule of every compound works, usually with the intention of isolating an active ingredient then synthetically mimicking it to produce a patented drug that will yield high profits. Consider that a seed contains a source of life with past, present, and future potentials. Perhaps black seed oil, used beneficially for over 2,000 years of known history among several civilizations and cultures, shouldn’t be ignored for using as-is.